Resources for the BASIC Stamp 2 microcontroller including the Stamps in Class series. What are control systems and how can they be used with the BASIC Stamp 2? Check out this in-depth tutorial to find out! Get started with basic circuits and programming! What's a Microcontroller? is a fun and engaging introductory text for the BASIC Stamp microcontroller and Board of Education, or BASIC Stamp HomeWork Board. 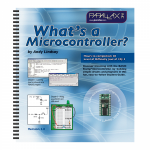 Read more about What's A Microcontroller? Build your own robot, wire it up with sensors, and let it roam on its own. 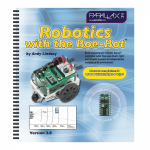 Robotics with the Boe-Bot includes step-by-step assembly instructions, circuit-building, and programming for the BASIC Stamp-based Boe-Bot Robot.